Apr 2016 - What's your Diagnosis? "Snowball"
Snowball is an 18 year old FS DSH that presented to Animal Emergency Center for vomiting of one day duration and change in respiratory pattern of one day duration. No coughing, sneezing, or diarrhea noted. Snowball has a history of intermittent upper respiratory infections but is otherwise healthy. Normal drinking and urination. Normal appetite. No current medications. On physical examination, Snowball was dull with hypothermia of 96.0 F. Her mucous membranes were pale pink and tacky. She had a moderate skin tent. No heart murmur or gallop were ausculted. Femoral pulses were weak. An expiratory push was present, no crackles noted. Mildly painful abdomen on palpation, no masses identified. There were no obvious signs of trauma. Based on her initial physical examination, she was determined to be in shock with a respiratory component. She was given oxygen support and warmed while diagnostics were performed. Electrolyte analysis revealed mild metabolic acidosis (pH = 7.23, HCO3 = 18.1 mmol/L). CBC revealed moderate to severe leukopenia of 2.2 x10^3/µL (range of 5.5-19.5x10^3/µL) and mild thrombocytopenia of 184x10^3/µL (200-500x10^3/µL). Blood chemistries revealed mild azotemia with BUN of 46.1 (15-32 mg/dL), mild hyperphosphatemia of 7.5 (2.6-6.0 mg/dl), hyperglycemia of 213 (70-130 mg/dl), elevated amylase of 1600 (100-1500 U/L), and elevated magnesium of 3.0 (1.8-2.7 mg/dl). 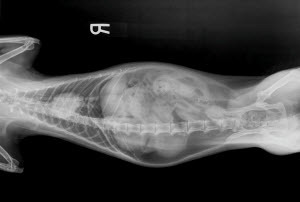 Lateral and VD full body radiographs were taken to asses underlying cause of respiratory status. You may click on the x-ray images shown here to enlarge. Our first referring veterinarian to respond with the correct answer will win free breakfast for their staff compliments of AEC! (please send response by email to diagnosethis@aec4pets.com or by fax to 248-348-1784). The first correct response we received was from Dr. Michelle Meyer at Serenity Animal Hospital. Congratulations! We hope everyone at Serenity enjoys your breakfast! 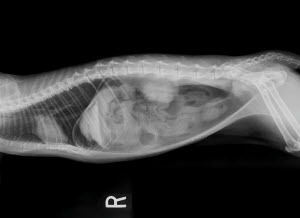 Radiographs reveal gas opacity cranial to the liver and highlighting the separate lobes of the liver as well as the diaphragm. The retroperitoneal space is highlighted by gas opacity. The entire left side of the abdomen on VD view has a gas opacity. The diaphragm appears intact. There is a moderate amount of feces in the proximal colon. There are metallic sutures in the ventral body wall. The thoracic cavity appears normal on lateral view with normal pulmonary parenchyma, cardiovascular features, and musculoskeletal components. The VD is not completely straight and thoracic structures are difficult to completely interpret. Radiographic Interpretation: Pneumoperitoneum (R/O - trauma versus ruptured / infected viscera).